As I promised in the last Mouse Castle Lounge podcast, here's a look inside Club 33, Disneyland's exclusive members-only restaurant. 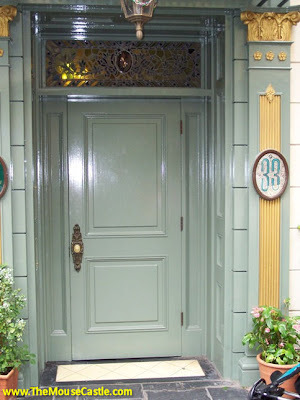 Club 33 was originally intended to be a private place where Walt Disney himself could entertain VIPs away from the hustle and bustle of the park. Sadly, Walt passed away before the club was completed in 1967, but it lives on as an elite hideaway where members and their guests can enjoy a quiet and elegant meal. Aside from the number 33 that adorns the entrance, there are no other signs or special markings to identify Club 33. It would be easy to not even notice it unless you were looking for it. Stories persist on how Club 33 got its name. The most popular notion is it was named for 33 Disneyland corporate investors/sponsors that were around when the club was built in the late 1960s. The fact is, it's just the number for that particular door on Royal Street in New Orleans Square. The address for the Blue Bayou Restaurant next door is 31 Royal Street. To step into the Club 33 foyer is to transport yourself to a world far removed from Disneyland's hectic crowds. Victorian and Napoleonic flourishes abound, with sculptures, busts, artwork, vintage furniture and textured wallpaper everywhere. You reach the restaurant itself by climbing the stairs to the second floor or by taking the old fashioned Parisian lift that accommodates two or three passengers at a time. Custom dictates that guests who have never visited Club 33 nor been in the elevator before should be given preference to ride instead of walk. The lift, by the way, is not wheelchair accessible. Disabled guests requiring assistance must use a freight elevator behind the Pirates of the Caribbean queue to reach the back entrance of the kitchen adjacent to the Disneyland Dream Suite. It's not the most glamorous way to enter Club 33 and reportedly this issue will be corrected with the next major club refurbishment. At the top of the stairs is Lounge Alley, the L-shaped passageway that connects Club 33's two dining rooms.﻿ Take some time to explore this area which is full of beautiful antiques and Disney art. This table was used in the film Mary Poppins. Costume design sketches from The Happiest Millionaire. The view from the balcony. "When I'm human, and I'm gonna be...."
Sunday lunch includes a complimentary glass of champagne which...ahem...went well with my dirty Grey Goose martini. I ordered food too, I swear. See? I told you there was food. A salad, antipasto and dessert buffet accompanies your lunch entree. Did I mention there were desserts? At the other end of Lounge Alley is the second dining room dubbed the Trophy Room. Once upon a time, there were plans to have audio-animatronic characters around the room interact with the guests. It never panned out. The room was also once adorned with actual hunting trophies which the Disney family has removed over the years. I've been very fortunate to dine inside Club 33 on more than one occasion. With it's wonderful atmosphere, excellent food and impeccable service, it's always a special event to be treasured.